After the submission deadline is before the submission deadline. Even though the submission deadline for this year’s Academy of Management Annual Meeting was just two weeks ago, the next one is already around the corner: the Strategy Practice Interest Group at the Strategic Management Society (SMS) Conference on “Strategies in the world of networks” in Madrid, September 20-23, 2014, invites submissions by February 27, 2014. 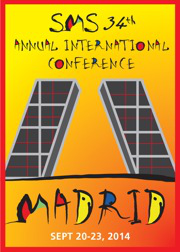 The conference theme provides an opportunity to rethink strategy practice. A dynamic perspective on strategy practice fosters greater attention to the emergence of practices. At the same time, it provides scope to appreciate that such emergence provokes emergency in the way judgments (phronesis) are called for in performing strategy practice in an ever-uncertain and unpredictable world. Lehtimaki also emphasizes that one of the greatest benefits of the SMS is that you get to submit an early stage paper (7 pages, 4000 words) and receive good and insightful reviews for work that is under development. This entry was posted in SAP Meta and tagged Hanna Lehtimaki, SMS, Strategy Practice, Strategy Practice Interest Group. Bookmark the permalink.